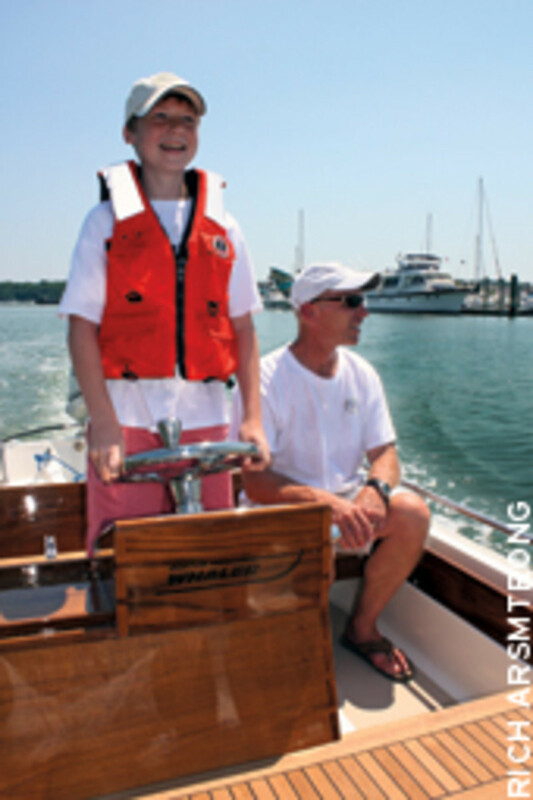 You can buy a kit with all the mahogany necessary for replacing the wood on an old 13-foot Boston Whaler. 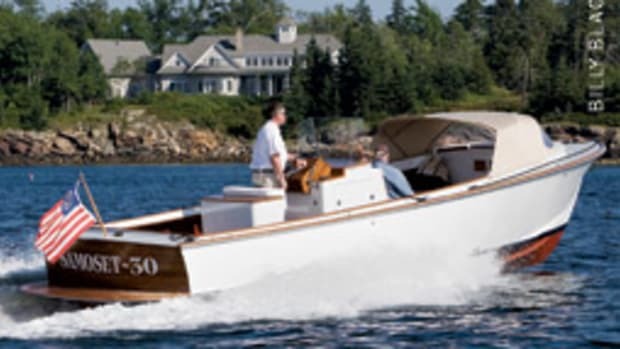 But Peter Crenier was seeking a different look for his 1984 Whaler, one that matched the colors and wood type of his big boat, a Sabre 38 — an express with traditional New England lines, a pilothouse and ample brightwork. 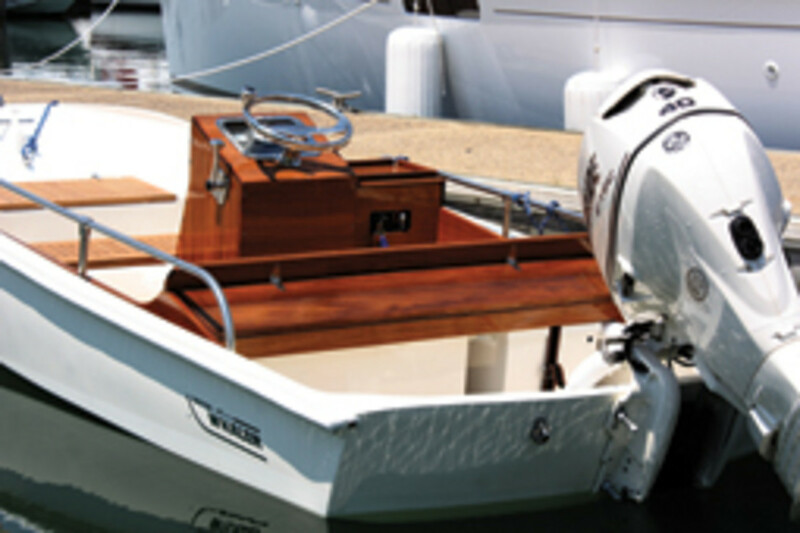 Crenier’s scenario illustrates a couple of advantages of retrofitting an older boat: creating something to your own liking and controlling — or at least trying to control — how much you spend on your “masterpiece.” However, boat owners who go the refit route often struggle to meet the budget for the project. They usually reference — albeit jokingly — the grief they receive from their better half after she becomes aware of the final bill. 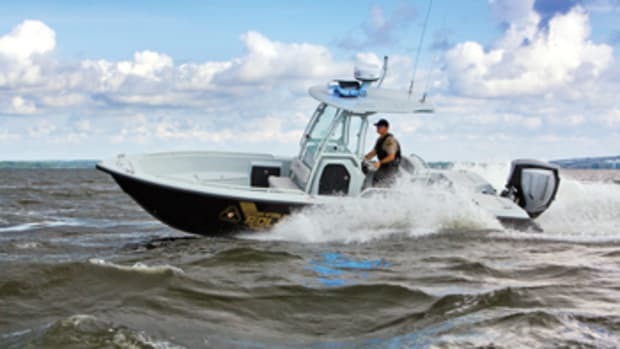 In addition to replacing all of the wood, Crenier replaced the 40-hp 1984 Johnson with a new Evinrude E-TEC 2-stroke (with electronic fuel injection) of the same horsepower. He bought a custom fuel tank; had all of the hardware rechromed through Nu-Chrome Chrome Plating & Metal Restoration (www.nu-chrome.com) in Fall River, Mass. ; replaced the steering system; and had a stainless-steel steering wheel and knob from Gem Products (www.gemlux.com) in Orange Park, Fla., installed. 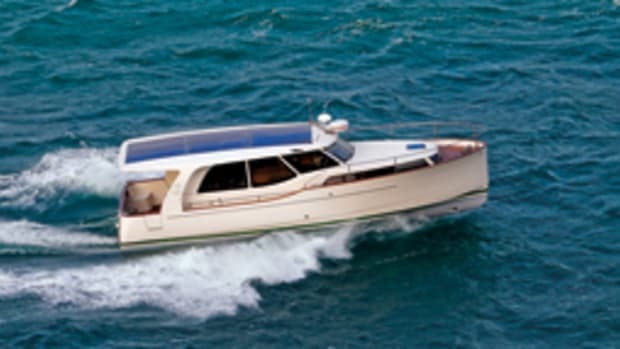 He and his 13-year-old son, John, ground down the hull and all surfaces to remove stress cracks, and they used resin and glass to repair the dozens of holes (from hardware fasteners), small chips and gashes around the deck and hull. A 3-inch hole in the starboard side was repaired, too, and Crenier hired a friend to professionally Awlgrip the boat in the same oyster white that coats his Sabre. Jeff Perette supervised the father-and-son team’s work and then completed all fiberglass finishing and fairing. The Creniers also helped with the painting. Crenier knows boats, and he and his son weren’t afraid to dig into the grunt work of grinding, says Perette, who carried out the final priming prior to the Awlgrip. Perette also used Awlgrip to paint the non-skid, using a dark mustard tan like the Sabre. 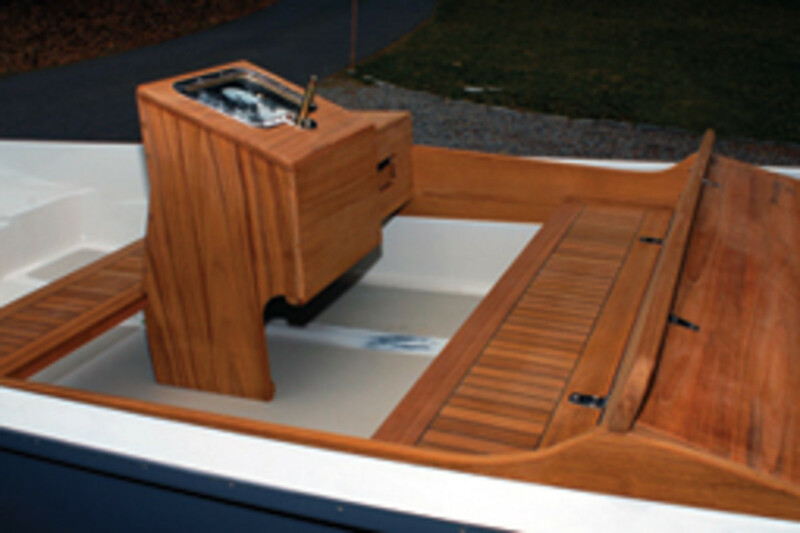 Perette wanted to show the boat in his display at the New England Boat Show and asked Crenier to help him prepare it. “The response we got from people at the show was spectacular,” Crenier says. 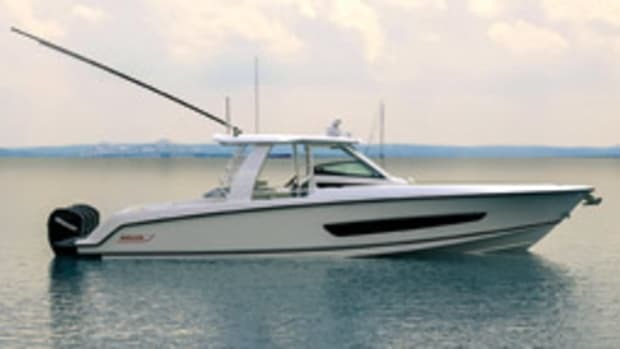 “Some didn’t even realize it was a Whaler or a retrofitted Whaler but a great-looking and unique boat.” And that’s just what Crenier wanted. Before trailering the boat to East Coast Fiberglass, Crenier sold the engine and existing woodwork and stripped the bottom paint. The Whaler had no water in the foam that fills the hull skins, so no structural work was required. 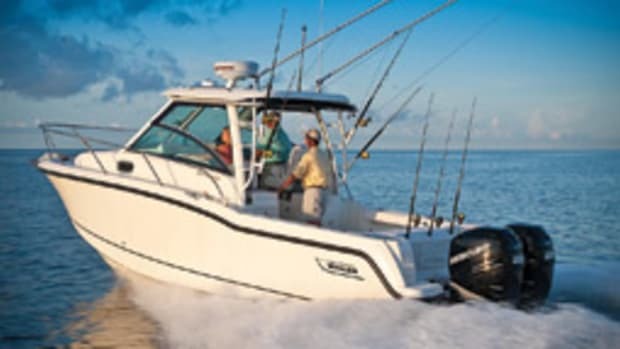 “When you have a good foundation to start with, the finished product is going to be that much better,” says Perette, who used a moisture meter to check the hull and weighed the boat. It was close to the original weight of about 330 pounds. The woodwork was another project altogether. “I am fairly good with woodwork, but I didn’t want to ruin the teak, which was $38 to $40 a foot,” Crenier says. He hired Michael Ide of Ide Woodcrafts (www.idewoodcrafts.com) in Hingham, Mass., a furniture maker who also does marine carpentry. 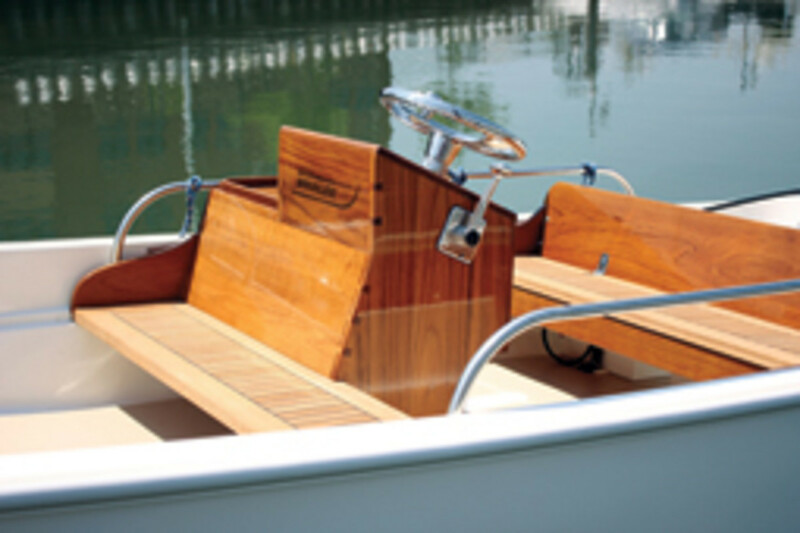 Ide based his design on the teak woodwork of Crenier’s friend’s boat. The decks are usually based on templates that the owner or boatbuilder provides, Wormwood says, but Crenier’s project required no template. 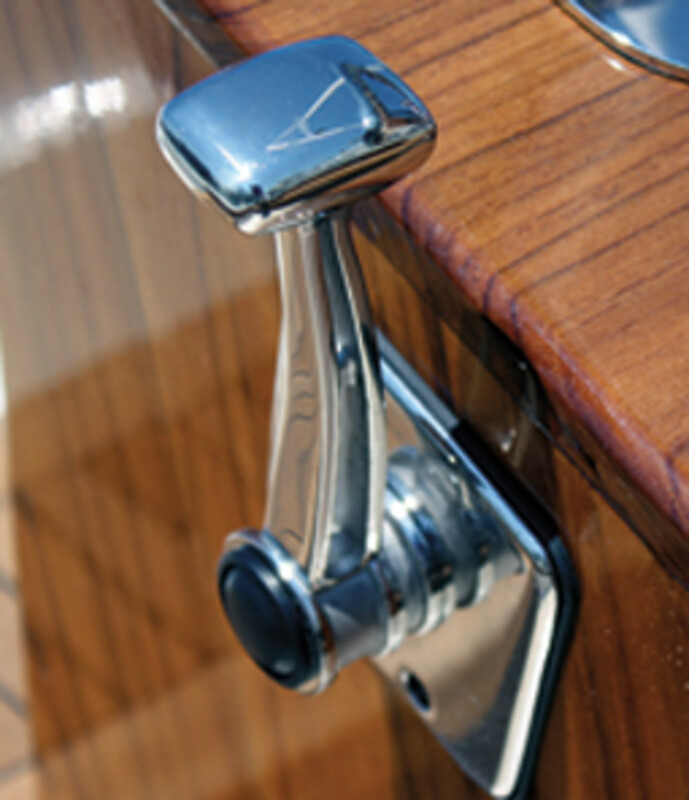 Teak Decking Systems supplies decks for a host of big-name production builders, such as Sabre, Chris-Craft, Hinckley, Sea Ray, Viking, Bertram and S2 Yachts (Tiara and Pursuit), as well as megayachts and cruiser liners. 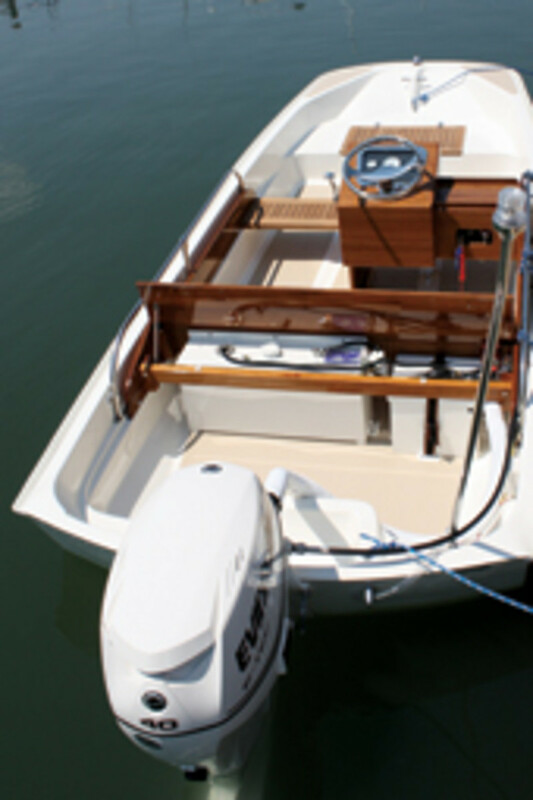 The rubber silicone is a proprietary seam compound, SIS 440 Teak Deck Caulking, and the epoxy is specially made for bonding teak to the subdecks, Wormwood says. Perette coated the teak with one layer of Epifanes varnish and then three coats of Awlgrip Clear. “Awlgrip Clear has a 5-year guarantee if it is sprayed on,” Crenier says. 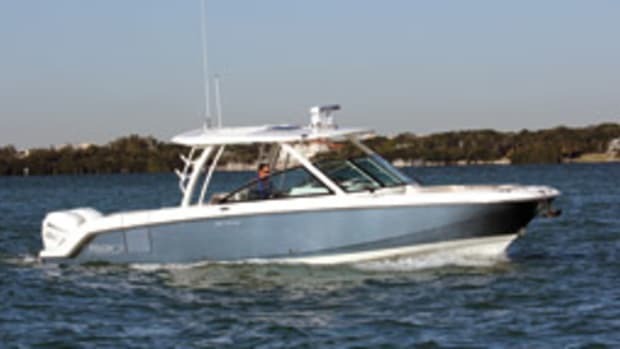 “This combination eliminates yearly varnishing and provides a very durable high-gloss finish that pops when you see it.” Crenier also had Perette use Awlgrip Clear over the entire boat for extra shine. The woodwork captures the attention right away. 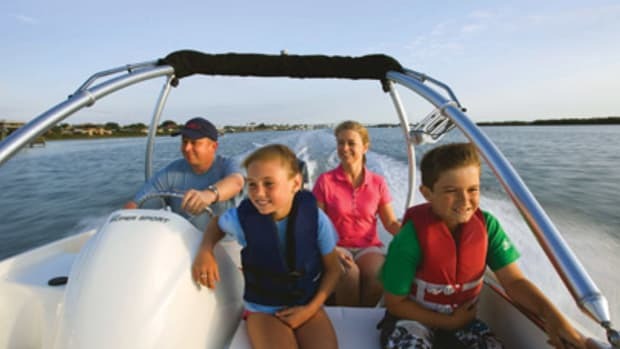 The bench seats stretch across the boat’s 5-foot, 5-inch beam, fore and aft of the starboard-side console. The aft bench has a backrest and lifts on two hinges to reveal storage behind. A second storage compartment is integrated into the aft side of the backrest and also opens on hinges. A 16-by-10-inch carbon fiber faceplate holds the ignition key switch and trim/tilt and bilge switches. Teak fiddles rim its top. The steering wheel and gauge panel are mounted on a console face that’s angled at 45 degrees. A center readout gives the engine vitals, such as speed, rpm and fuel burn. Two smaller identical gauges track the volts and fuel. The three sit in a recessed area covered with UV-protected windshield glass. A stainless-steel frame holds the glass. Port and starboard stainless rails about knee-high flank the midships area. 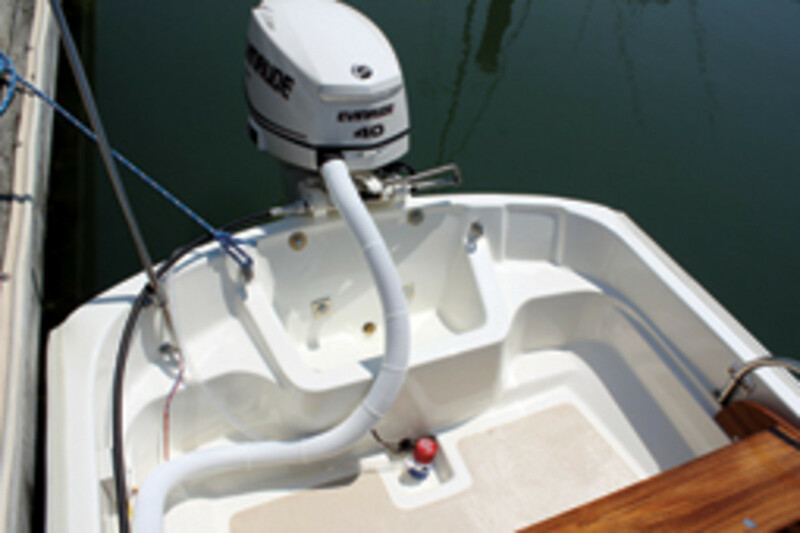 The companion portion of the console extends from the helm to the starboard gunwale. 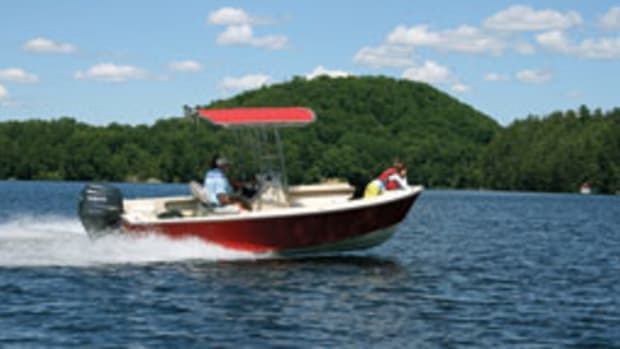 OK, so the boat has one imperfection.